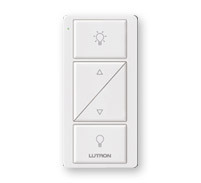 Lutron gives you the freedom to personalise the light in any space. Our single room solutions allow you to effortlessly adjust your lighting for different tasks – and our switches, wallplates, phone, and cable jacks come in a variety of colours to match your décor. 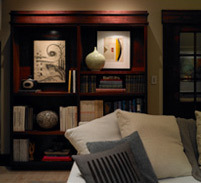 Create inviting, comfortable living spaces while reducing energy costs with Lutron dimmers and sensors. With a dimmer, you save energy every time you use your lights. Ensure lights in unoccupied rooms are never left on with an occupancy or vacancy sensor. Lutron controls are designed to look and work beautifully. Light affects the way you feel and the way things look around you. Dimming helps you to create moods and transform rooms, set the perfect atmosphere for entertaining or turn your bath into a soothing spa retreat. You can even match your décor with controls in a stylish colour and finish. Take your lights to a new level – control them from anywhere in a room or even outside your home. Control of your lights isn’t limited to a spot on the wall. 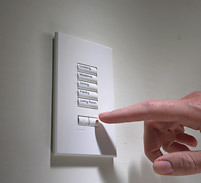 Adjust lights from your bedside or use an occupancy sensor so lights will turn off automatically. Add drama and excitement to your home with wireless control at the touch of a button. Create an affordable wow-factor for your home – dim the lights and start a movie, all without leaving your seat. Turn lights on or off from outside your home, whether you’re in your car or out for a walk. Adjust lights with an IR remote. Control of the light in your home is about more than electric lights – it also involves the ability to fine-tune how much sunlight enters a room. Silently adjust blinds or curtains to create privacy or protect valuable furnishings. Reduce glare on your computer and television from windows or a skylight. 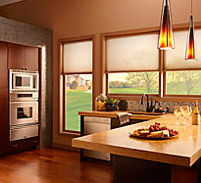 Add elegance with a variety of window treatment styles – more in shading solutions. Make lighting about your home and your lifestyle by personalising how you utilise the light in a room. 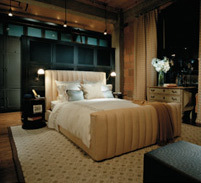 Create lighting ʺscenesʺ by controlling multiple lights in a room, such as a bedroom. Turn on a reading light or close the curtains from your bedside, or transform a family room into a home theatre experience. In your kitchen, adjust overhead, under cabinet, and sink lights with the touch of a button for food preparation, dining or clean up.